KNOXVILLE, IA -September 24, 2015 Jonathan Davenport digs out late pass on Jimmy Owens to take the win on night one of the Knoxville Nationals for the Late Model. Sharing the front row with Ricky Weiss Davenport bounced out at the green and lead the race for the first 19 laps .Owens chase hard from his 6th starting position and by the time the pair had reached lapped traffic Owens had managed to find his way into the race lead .Owen could only hold the race lead for 3 laps before Davenport was back into the lead, a lead he would not surrender. 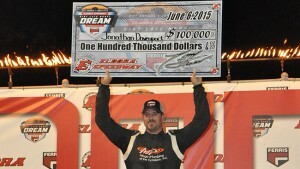 As the Late Models crossed the stripe it was Davenport, Owens and Don O’Neil Earl Pearson Jr and Chris Brown would round out the top five positions. 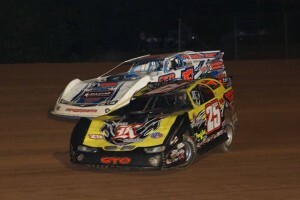 This report has been brought to the Wed with the assistance of DIRT LATE MODEL MAGAZINE . Keep up to speed with all the Dirt Late Model action from the US .To grab your copy visit the Dirt late Model page yours for A$7.95 Postage paid . ANTIOCH, Calif. – Sept. 13, 2015. Returning to Antioch Speedway for the second time in 2015 Daryn Pittman repeats his March 29 victory this time beating home Joey Saldana and Tyler Walker. A win is a win but bad luck finally breached the Schatz/Tony Stewart amour when the #15 suffered a flat right rear and was forced into the work area, Schatz would return at the rear of the field. Joey Saldana had won the pole position and lead the field to the green .Saldana controlled the race up until lap 4 with Schatz gave notice that his 30th race win was coming. The loss of his right rear forced Schatz to the work area and put end to a possible 30th race win .Once the field got back to racing Saldana assumed the race lead but it was not long before Pittman pounced on the #71 and raced into the lead. Pittman worked on extending his race lead over Saldana who had Tyler Walker taking his attention away from challenging Pittman .Walker making a return to outlaw racing was showing that he had lost none of his old fire and worked Saldana over. This was a something that the #71 did not need but he continued to thwart Walkers attacks. Finally Walkers attacks paid dividend and he found a way around Saldana. A lap after passing Saldana into Second the first of four late cautions came into play. Pittman was in control, only question left was what if anything could Saldana do after Tyler Walker.Lap 27 and the final caution, last play for Saldana and after have missed previous slide opportunities the Brownsburg Bullet made the last one count, the money move and regained his second position. 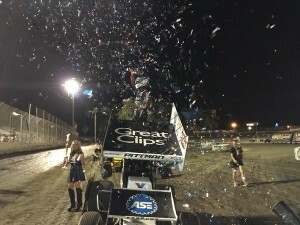 Antioch win to Pittman brings his 2015 race win tally to 5, Saldana secured the runner up position for the third night in succession and Tyler Walker makes strong statement that his racing form has retuned. 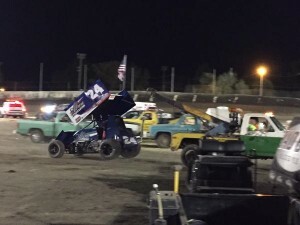 Rico Abreu set the pace during qualifying with fast time but while running in 6th position he flipped and his night ended .The #24 was returned to the Abreu hauler, Rico was unhurt. It has been a tough year for Pittman and the Great Clips KKR and win number 5 should give the team much needed confidence as they head the Clay County for the next Outlaw show. 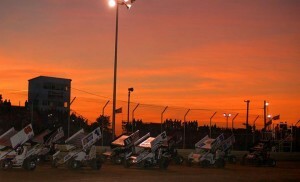 The next outing on the clay for the World of Outlaws will be Friday September 18 at Clay County Fair Speedway. Will this be the race that sees Saldana crack it for his 3rd race win of 2015? Joining the Outlaws at Clay County will be Danny Lasoski and Bryan Clauson . 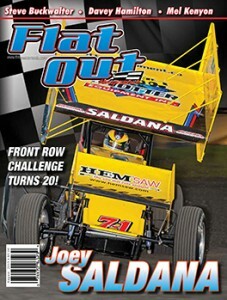 Sprintcar,Midget Speedcars and Super Modified racing across the US , all the facts and photos that will make you feel like you are trackside .Available now from our FLAT OUT PAGE .September edition has Joey Saldana as the cover story. 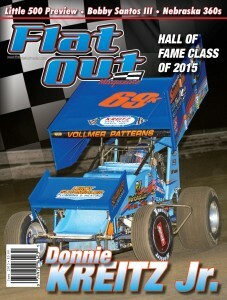 August/September Flat Out available now! Eldora Dirt Track has the 45th World 100 for Late Models underway. Over 100 entrants are on hand all chasing a share of the massive US$318, 850, 00 that is on offer. 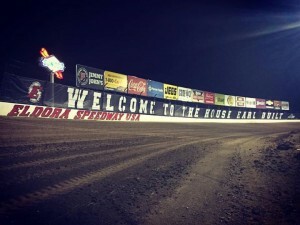 The World 100 was first raced at Eldora in 1971 and thanks to the vision of the late Earl Baltes has become one of the stands out events on the Speedway calendar. The World 100 runs over three nights with Saturday night the Championship night with the winner after 100 grueling laps taking home US$48,000 .Back in 1971 Earl Baltes put US$4,000 up as the winner’s purse and on that occasion the late Bruce Gould was first to put his name on the World 100 honor roll. 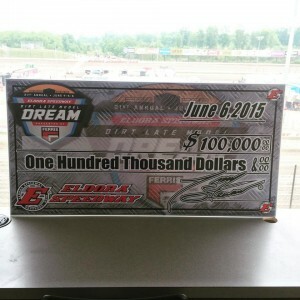 In 2014 Scott Bloomquist had to fight for his fourth World 100 victory after incurring a penalty on lap 19 for an unapproved lexan-backed window net.Bloomquist no stranger to controversy suffered a massive blow after crossing the line first in the 2015 Dream 100 only to be found 25 pounds under weight at the scales . Arguments still rages today on the penalty and how his car could have been passed by the race official during technical inspection earlier in the night. September 24th thru to September 26th three nights of fender rubbing Late Model action. 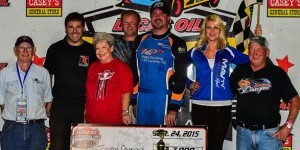 The Nationals attract the best field of powerful, aggressive Late Model drivers all wanting a share of the US$271,000.0 purse and the prestige of standing on top of the Knoxville podium. 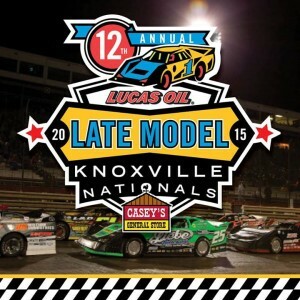 Two preliminary nights of racing over Thursday and Friday to qualify for the Championship race on Saturday with a pay day of US$40,000 to win in the Lucas Oils/Casey General Stores 12th annual Knoxville national. Boasting 10 wins so far in the World Of Outlaws Late Model Championship Shane Clanton is sure to be one of the fancied drivers .Not far behind in support will be Josh Richards ,Scott Bloomquist and Jonathan Davenport . 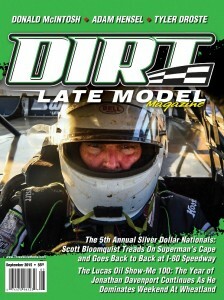 For all the latest Late Model news from across the US order the September Dirt Late Model Magazine .Feature stories on Jonathan Davenport and Scott Bloomquist. There is also a report on the 5th Annual Silver Dollar Nationals. Available now for delivery across Australia and New Zealand post free only A$7.95. Great photos 96 pages with all the action and colour. 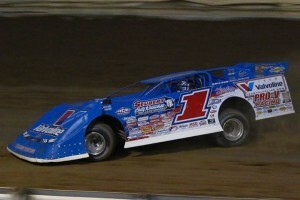 Visit our Dirt Modified and Dirt Late Model page on our web site to order www.talkingspeedway.com. From the highest profile driver to the local competitor the one thing they all share is their love of the sport. It is impossible to find the words to express how one feels when we suffer such losses. Rest in peace does not seem to be enough. They are never lost to us, our memories remains strong and those memories can help ease to pain, a pain we all feel. August 1st. 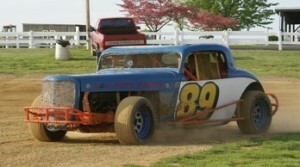 Carnie Frylogle 66 from Maryland lost his life at Susquehanna Speedway Park in York Country. Frylogle was racing in the ALL American Outlaw Series at the track .The accident occurred on the last lap of the 20 lap feature event. The All American Outlaw Series is not a high profile category, just a bunch of good old boys racing as it used to be. Carnie Frylogle has been racing since the moment he learnt to drive. 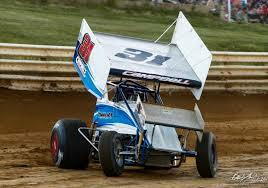 August 14 Williams Grove. 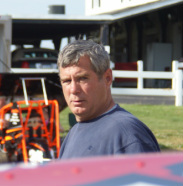 James “Jim” Campbell lost his life during “Hot Laps”. James was one of the many in Speedway that make up the car numbers at the tracks and without these competitor Speedway would not the exciting sport we all enjoy . James “Jim “Campbell was 45. 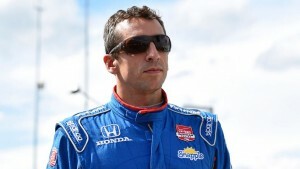 Indy Car driver, 37 year old Justin Wilson passed away on Monday following injuries he received when he was struck in the head with debris from another competitor’s car during the Pocono Verizon Indy Car Series. Wilson left Formula one in 2003 and began his career in the Champ Car Series during the 2004 season. Wilson won four Champ Car races before the series was taken over by Indy Car. Wilson had a total of seven wins during his Indy Car career. Motor racing is one big family worldwide and during time of despair and tragedy they join as one to support the families of those affected .Our prayers, thoughts will always be with them. 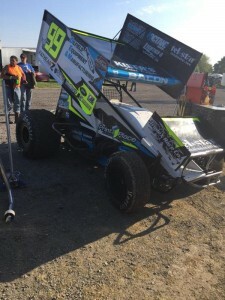 Please also think about American Midget and Sprintcar driver Kevin Swindell who was seriously injured during the recent Knoxville Nationals and Australian Solo Speedway rider Darcy Ward .It will be a slow road to recovery for both Swindell and Ward. Can we all continue to pray for all those families, their tears as they slide down their check is like a river of memories of all the good times and we hope that it helps in some way with their healing. 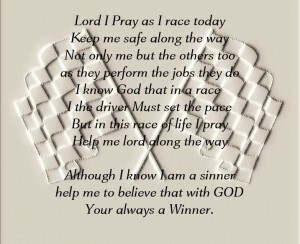 This message was posted by the All American Outlaws for all racers. 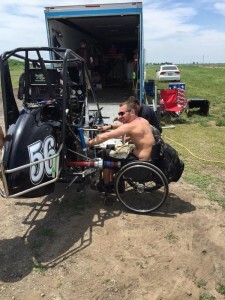 Back in August 18th 2014 a young praplegic racer scored his first sprintcar race . Isaac Schreurs who lost the use of his legs aged only 14th would finally realize a dream of winning in a sprintcar The American Sprintcar Series and Jefferson Speedway was the venue for this amazing achievement. 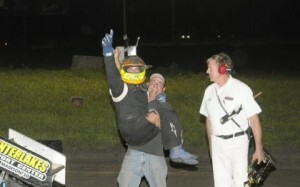 The normal wing dance which has become part of the winning celebration took a back seat as Isaac’s farther arrived in a four wheeler and lifted his son out and carried him to the front of the racecar to the cheers of the excited Jefferson fans. 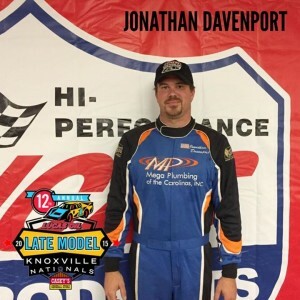 Isaac became the first ever paraplegic to win a major Sprintcar race .Former Knoxville Champion Justin Henderson and the experienced Jack Dover were in the field. Hmiel and Schreurs both faced similar challenges and have had to work hard to overcome hurdles as they battled the odds to reach their goals, Hmiel as a successful racecar owner and Schreur as a race driver . While Schreurs results during the POWRi Illinois Speedweek were less than he might have expected his presence in the pits and the sight of this amazing young racer working the spanners preparing his car must be inspiring to all those parked in the pit enclosure. Darren Hagan and Christopher Bell were tied on points at the conclusion of the POWRi Illinois Speed Weekweeks and declared joint Champions . Want to keep up to date on all the open wheel Sprintcar and Midget action from the US then Flat Out Magazine is your magazine , Great reports amazing action photographs jus A$7,95 direct to your door any postcode in Australia or New Zealand . Go to the flat Out page to order NOW! Bloomquist crossed the stripe ahead of Davenport at Eldora Speedway in the Dirt Late Model Dream 100 lap, but at weigh in he was 25 pounds under weight and forfeits the win to Davenport together with the hundred grand, ouch that hurt. 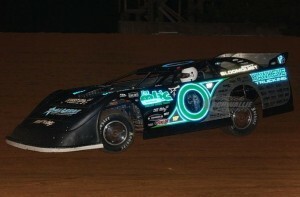 Bloomquist had to withstand a late race charge from Davenport who ran the topside aggressively over the closing laps. Bloomquist no stranger to controversy over his career .The question of being overweight at the scales is nothing new in Speedway , many teams has suffered the same penalty and the questions continue . Shannon Babb in 2005 forfeited his World 100 win when he weight in 10 lbs under weight. Many race fans over years have called Bloomquist a cheater as many times during his successfully career he has sent confusing messages with his on track antics such as spinning in the mud directly after winning races and before going to scale. I am not sure just how much mud this action would pick up but its claimed amongst and some competitors that this is to ensure he makes the weight .Opinions is divided among the many fans. Bloomquists main problem as I see it is that he is so successful and it is a strange attitude shared by many race fans to criticize the guy because his special talents puts him at the very top of his race category. Being under weight is difficult to understand particularly has each race car goes through race inspection before getting cleared to race .Miscalculation of the fuel burn may well be the problem or as some claim a piece of the car fell off during the race, this cause could be easily solved by finding and matching the part to the car . After the race Bloomquist was not available for comment. For all the Dirt Late Model reports ,action shots get the current edition of the Dirt Late Model Magazine available from the Dirt Modified and Dirt late Model page @www,talkingspeedway.com. In 2014 Dale Blaney headed the Ohio podium after taking out the Kistler Engines Classic from Mintz and Jacob. 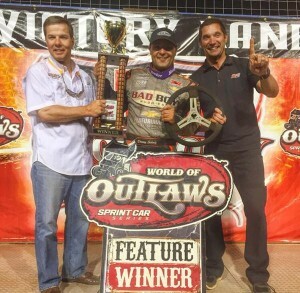 Local knowledge is a massive advantage but the current scorching form of defending Outlaws Champion Schatz is intimidating not only for the Ohio boys but for the traveling Outlaws . Certainly the punters will load their money on Schatz to take win number 12 but with a field of determined locals and motivated Outlaws this is no easy task. As the Outlaws roll into the Attica pits Donny Schatz comands a 79 points lead over Shane Stewart with Brad Sweet a further 96 points back in third.Since moving from Roth Motorsports to Destiny Motorsports replacing Craig Dollansky David Gravel has regained his mojo with a super effort at Charlotte finishing second to Schatz . 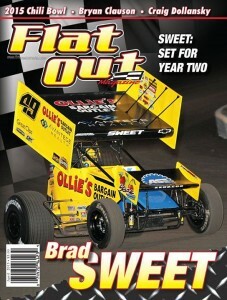 You can check out all the open wheel action from across the US by ording your copy of Flat Out magazine .Current edition has Brad Sweet on the cover.Order Now Au$7.95 including shipping direct to your door in Australia or New Zealand . 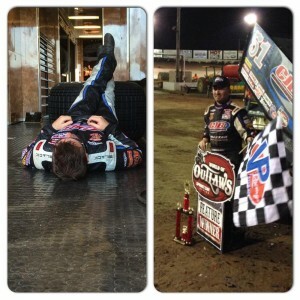 McMahan , Bell and Stewart Outlaw weekend winners ! After having won the right to share the front row in the feature with Joey Saldana, Bacon raced into the race lead from the go of the green. Driving his own racecar Bacon had to call on all his USAC experience to master and keep the bucking winged 410 monster ahead of the charging outlaw’s .Lap 32 and finally McMahan got by the USAC Champ for the lead. Back in the pack the six times Outlaw Donny Schatz was on a masterful charge from P20 .In 20 laps Schatz had moved from 20th to 5th behind Kraig Kinser. 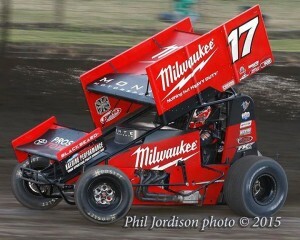 Schatz would progress no further than fourth behind Joey Saldana. A race night that started out so strongly for Shane Stewart with fast time in qualifying turned sour when the Larson Marks driver brought out a red flag for the second time when he went into the wall and upside down in turn #3 and 4 .Australian Kerry Madsen also had a race night that both he and the team would prefer to forget. Rico Abreu was racing strong early winning the dash to earn pole but was unable to fire up his race car and missed the start .Once fire up Abreu made it back to the race only to crash into Kerry Madsen during traffic and rolled . Abreu emerged unhurt. Paul McMahan “”I had one shot at (Bacon) on that restart,” McMahan said. 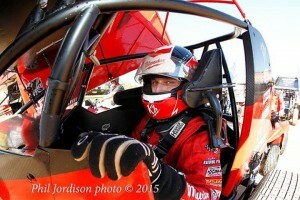 “I was able to get a pretty good restart and get a good run on him. Instead of trying to slide him down there in one and two I just thought I’ll follow him there and then try to slide him down there. Down in three and four, you get down in there and it takes off on you in the dust. I didn’t know if I had enough room or not to go for the lead. Bacon lost momentum and was forced to hold off Joey Saldana running in third. He eventually ran McMahan back down but a caution flag came out with three to go. The next schedule race for the Outlaws is May 8 and 9 at Eldora Speedway and Donny Schatz takes a 29 points advantage over Shane Stewart ,67 to Sweet . 107 to Saldana and 130 down to McMahan . PEVELY, Mo. 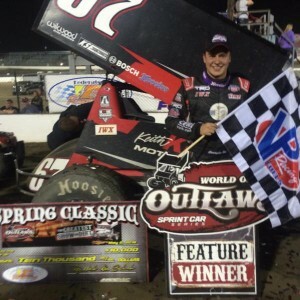 – May 2, 2015 Christopher Bell returned to the World Of Outlaws with car owner and Keith Kunz to score only his second World of Outlaw A main win . 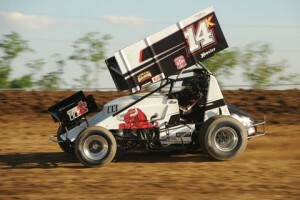 The Spring Classic at 1-55 Raceway welcomed back Sammy Swindell for a rare Outlaw appearance by the veteran. .Swindell was on the money immediately and with Jason Sides disputed the race lead with Bell for most of the 40 lap A Main..
Australian Kerry Madsen held the point for the first 14 laps before Bell worked a slide for the race lead .Madsen would not regain the lead and would fall back into the pack to finish in 12th position. Brad Sweet jumped into the race lead from the green but it was Aron Reutzel making his first World of Outlaws start who controlled the race for the first five laps. Lap six and Sweet makes the move into the lead and holds that position as they run through the tenth lap. Now it was Stewart who would take control and head the race and be first to greet the checker .Stewart was followed across the stripe by Sweet and Pittman. Shane Stewart ready for a third Outlaw win in 2015Brad Sweet jumped into the race lead from the green but it was Aron Reutzel making his first World of Outlaws start who controlled the race for the first five laps. Lap six and Sweet makes the move into the lead and holds that position as they run through the tenth lap. Now it was Stewart who would take control and head the race and be first to greet the checker .Stewart was followed cross the stripe by Sweet and Pittman. 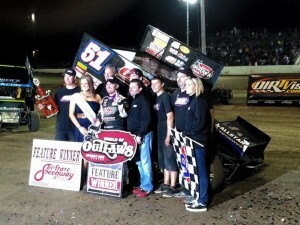 Stewart’s third World of Outlaw Sprint Car Series victory of the season puts him second only to Donny Schatz in total wins. Schatz’s lead in the championship standings is down to six points over Stewart. 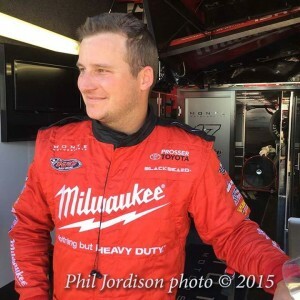 Monte Motorsports announced today that they have signed Californian and dual KWS Champion Kyle Hirst for a return season behind the wheel of the Milwaukee Tools Monte Sports WA#7 . Hirst’s first year with the team was highlighted by his win in the 43rd Lucas Oils Grand Annual Classic at Warnambool’s Premier Speedway. 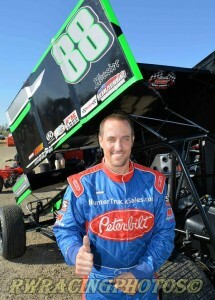 .Hirst also finished the World Series Sprintcar Series in 5th position after leading the series early in the tour . Kyle Hirst, WSSC rookie of the year in 2014/15 was without doubt one of the most followed driver in the series right across Australia .